This Display Cabinet Has Halogen Lighting and Clips for Securing Shelves! 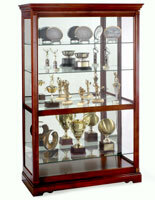 This Display Cabinet Comes with Four Glass Doors and Nickel Metal Finished Hardware! 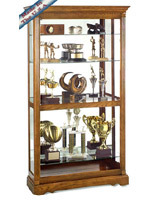 This Display Cabinet Is Shipped by the Thousands! 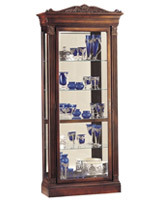 4 curved, glass doors feature nickel finished hardware. 4 levels of lighting with a No ReachTM light switch, located on the back. Elegant Black Coffee finish adds style to any room. Halogen lighting creates a brighter illumination of your collectibles. Cushioned Pad LockTM metal shelf clips stay in place. 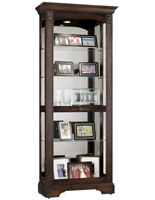 Glass shelves are height-adjustable to display various-sized items. Mirrored back draws in additional light to highlight displayed collectibles. Plate grooves give you the option of vertically displaying plates. Adjustable floor levelers increase stability. 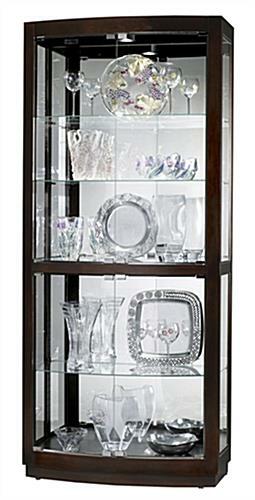 This display cabinet provides more modern styling to produce an elegant presentation inside your home. 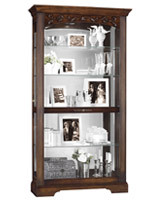 The curio cabinet, display cabinet incorporates four curved, glass doors giving you comprehensive entrance to exhibited articles. 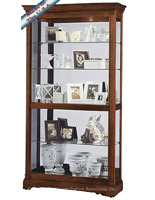 Its glass shelves are also height-adjustable, enabling it possible to exhibit numerous-sized collectibles inside the curio cabinet. 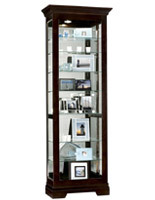 This display cabinet, likewise recognized as display cases, has a mirrored back to further accentuate your keepsake articles. 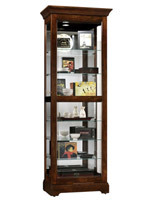 We offer the display cabinet with halogen lighting to truly showcase the elegance of each collectible. 35.0" x 82.0" x 17.0"